The serrated peaks zig-zag dramatically across the skyline – the unmistakeable silhouette of a 430 km (265 miles) line of mountain ranges that jumps from a standing start right out of the vast outback plain. Blindfold me and drop me in the middle of it and I’ll know EXACTLY where I am. Praise be I’m in South Australia, so I’ve pretty much got that killer Flinders Ranges landscape all to myself! St Mary’s Peak, 1171 metres (3842 ft) above sea level and highest point, is pretty low by world standards. But from the plains below, it soars to the apex of a 17 km (10.5 mile) stretch of jagged pinnacles forming the outer rim of Wilpena Pound, best known attraction in the Flinders Ranges. Cars on the road below, dwarfed by these ancient landforms eroded over millenia to a fraction of their original size, will rust into oblivion before these timeless ranges turn to dust. Yes, channelling my inner philosopher while travelling the folds and faults of the Adelaide Geosyncline forming these ranges is WAY too easy! 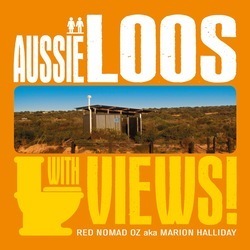 It’s also WAY too easy to admire the staggering Flinders Ranges scenery, especially because there’s no amazing view that can’t be enhanced by an awesome scenic loo! IMHO. But even if you’re not an amenities admirer or dunny detective like me, it’s got enough mountains, gorges, historic sites, wildflowers, rock formations, lookouts, 4WD tracks and wildlife to keep you busy. SO … if you HAVEN’T been here, you’ll be wondering where to start, right? DON’T PANIC! All you need to do is follow my ‘How to spend 7 days in the Flinders Ranges’ guide! This 7 Day Flinders Ranges itinerary is mostly based in the Central Flinders Ranges, and Ikara-Flinders Ranges National Park. That’s because I’m being gentle with you – after all, it’s your first time! There are LOTS of Southern, Northern and Central Flinders Ranges things to do, but you can’t do everything in 7 days, right? So I’ve made it it easy for you with a week’s worth of some of my favourite activities and attractions in three great Flinders Ranges destinations. Get started by driving to Quorn, 335 km (208 miles) north of Adelaide in the Southern Flinders Ranges. Pick whichever self-drive route from Adelaide which appeals to you the most. Route 1 – Food and Wine trail via Clare: drive 143 km (89 miles) to Clare (detour via the Barossa Valley on the way if you like), then 193 km (120 miles) to Quorn via Laura, Wirrabara and Wilmington. Route 2 – Country South Australia: drive 216 km (134 miles) to Jamestown via Clare, then 148 km (92 miles) to Quorn via Orroroo and Wilmington (detour into Alligator Gorge near Wilmington if you like). Yes, this way is a bit longer. Route 3 – Coastal Ports (tautology alert!) via Port Augusta: drive 306 km (190 miles) to Port Augusta via Port Wakefield, Port Pirie and Port Germein (add a few extra km for detours into the ports), then 41 km (25.5 miles)to Quorn. Be WARNED: If you’re sightseeing along the way, getting to Quorn will take nearly a full day. To make the most of the Flinders Ranges, I suggest starting your trip a day early! Select from my lists of things to do in each destination. Attractions and activities are split into MUST DO – my suggested top picks; and MORE Things to DO – alternative/extra activities and attractions. And for the most pleasurable places to do your business, look out for my *Scenic Loo alerts! On Day 3 drive 67 km (41.5 miles) to Hawker. Kanyaka Homestead and Death Rock – stop at these historic sites en route from Quorn to Hawker for insights into local colonial and indigenous heritage. From Hawker, drive 52 km (32 miles) to Wilpena Pound. STAY: Rawnsley Park Station (Campground,Cabins, Units, Eco-Villas); or Wilpena Pound Resort (Campground, Standard and Deluxe Rooms, Safari Tents). Other options including Station Stays and campgrounds in Ikara-Flinders Ranges National Park are also available in the area. St Mary’s Peak – This strenuous hike (14.6 – 21.5 km (9-13.5 miles) depending on route taken) is a Flinders Ranges showpiece. But if you viewed the panorama in Hawker (see above), you already what’s to be seen from the summit! (ps I haven’t done this hike either). Wilkawillina Gorge – Drive the 34 km (mostly dirt) past the Bunkers. The gorge hike is 11.4 km (7 miles) one way – even if you don’t do the whole walk, the scenery is spectacular. Hucks and Stokes Hill Lookouts – 10 and 13 km (6.2 and 8 miles) from Wilpena Pound. Visit them en route to Wilkawillina or Blinman. Bridle Gap – Part of the Heysen Trail, this 18.8 km return hike crosses the Pound and offers great views from the Bumbinyunna Range on the other side. Much of the hike is flat and easy going and is an alternative to the much more difficult St Mary’s Peak trail. This is just a sampler of alternative activities – ask for more details at your accommodation. On Day 6 drive 59 km (36.5 miles) north to Blinman. 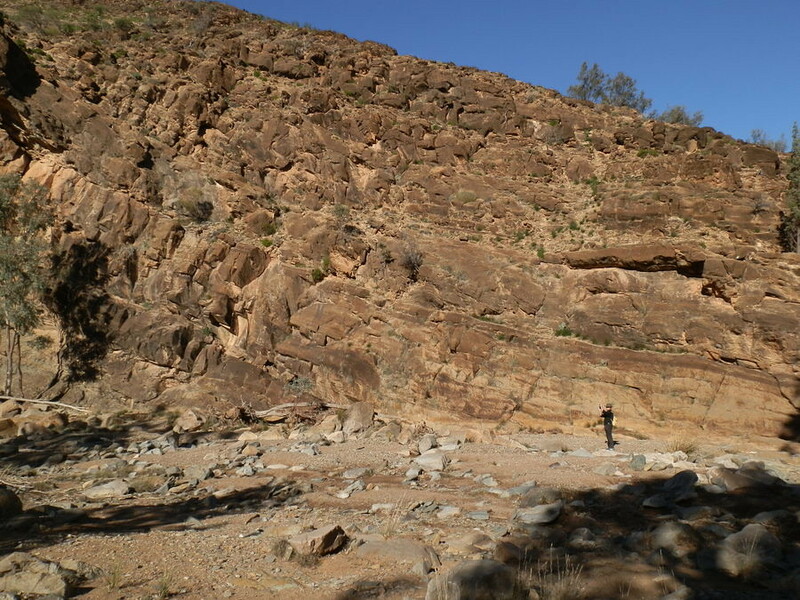 Mt Emily and the Great Wall of China – Interesting rocky outcrops, and yet another Great Wall – this one Flinders Ranges Style! Drive 14 km (8.7 miles) from Blinman to Angorichina Village. 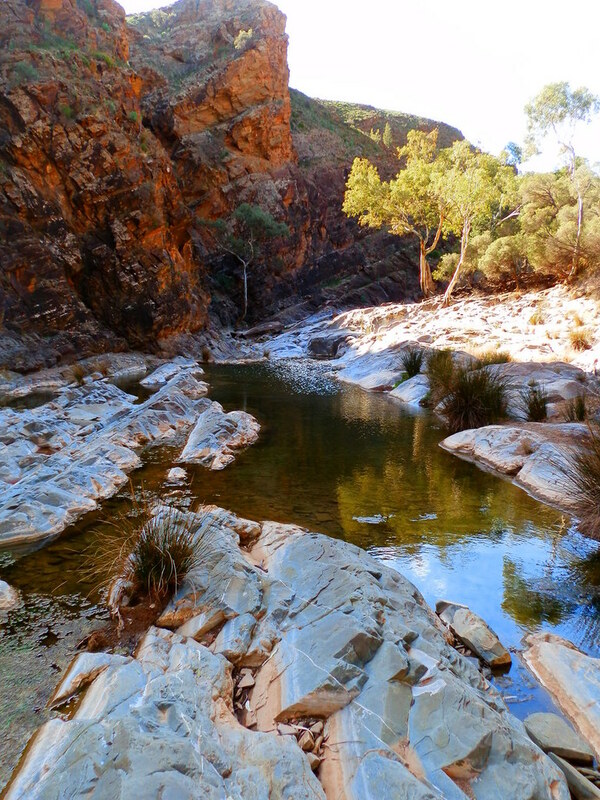 Blinman Pools Hike – Follow Parachilna and Blinman Creeks through sheer cliff faces, gorges and rocky creek beds for 10 km (return) to 1st pool, then 1 km (return) to 2nd pool. 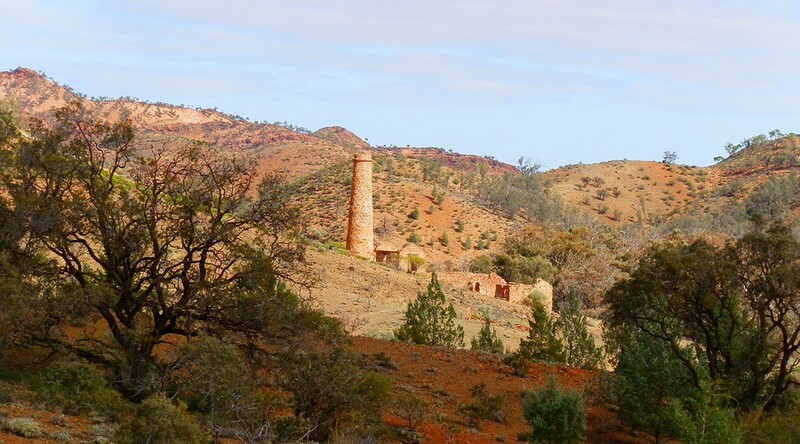 Nuccaleena Historic Mine Site – add another 34 km onto the Glass Gorge loop and visit this remote mine. This leg is 4WD on rough, rugged roads and station tracks. So … now your 7 days are up and it’s time to go. But the adventure isn’t over yet. Return to Adelaide by driving 18 km through Parachilna Gorge to Parachilna (*Scenic Loo alert! )for a Feral Mixed Grill and a Fargher Lager! A great end to a great week. But the good news is that if you’re not yet ready to end your holiday, you can check out the things to do in Port Augusta on your way back!! 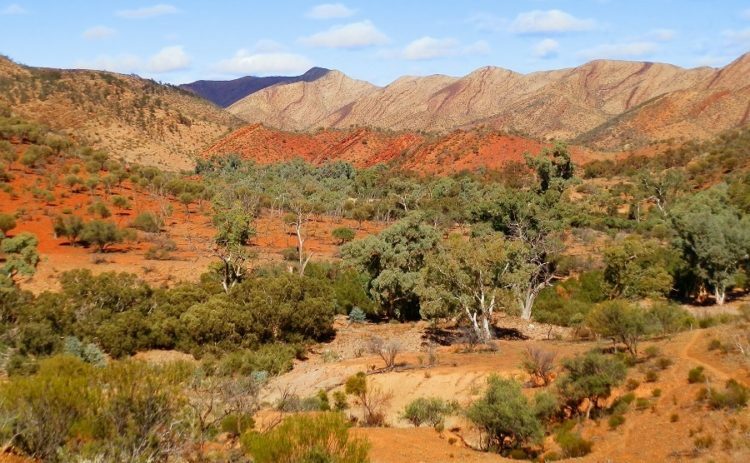 WHAT: The Flinders Ranges is a 430 km long region of mountain ranges in the South Australian Outback. It includes the Ikara-Flinders Ranges National Park; Vulkathanha-Gammon Ranges National Park, Mt Remarkable National Park, several Conservation Parks, many natural attractions and numerous sites of historic and cultural significance. WHERE: The Flinders Ranges are north of Adelaide. From Adelaide, it’s 335 km (208 miles) to Quorn, 400 km (248 miles) to Hawker and 508 km (315 miles) to Blinman. DRIVING: Self-drive is the easiest way to get around. PLEASE NOTE: some of the roads and trails described in this post require 4WD or high clearance. Please check road conditions and vehicle suitability before you drive. FACILITIES: Meals, groceries and other supplies are available in smaller centres such as Wilpena Pound Resort, Rawnsley Park Station, Blinman and Angorichina Tourist Village. Fuel is available at Quorn, Hawker, Wilpena Pound, Angorichina Tourist Village and Parachilna. See Australia Month by Month Part Two: July to December Travel Teasers! Often the problem with travelling in such a big country is that there is WAY too much for just one trip, Neha! The best way (in my opinion) is to choose a few things you REALLY want to do, then see/do them thoroughly. That’s why I write guides to one region – because that’s how I like to travel myself! A year sounds like a long time but it’ll go VERY quickly, Chiera! There’s a few other things to do in South Australia – check out my top 10 post if you like!! First it’s a road trip, second, it’s in Southern Australia- I am sold completely! This itinerary seems viable for us as a week is what we can manage with our full-time jobs. That aside, the pictures are breathtakingly beautiful and I am only craving more for a visit here only. That combo works for me too, Harsh! And my advice to anyone with limited time is don’t let that stop you from doing stuff! Do what you can when you can!! This sounds like a fantastic trip! I’ve never visited Australia but it’s definitely on my to-do list. I love National Parks and hiking so I think I would feel right at home here. It doesn’t look entirely different from the sandstone hillsides of Southern California. The Alligator Gorge detour sounds pretty exciting! Tragically (or happily, depending on your point of view), there aren’t any alligators in the gorge, Janine!! Even so, it’s still a cool place to go!! And you’re right – there are some similarities to Sth California. Maybe one day I’ll check them out and see how different it really is!! It’s so hard to believe it’s such an open and vast space with virtually nothing except for mountains. Amazing. I’d love to do the food & wine trail route – definitely taking that detour through the Barossa Valley for some wine. We’re planning a trip there for next year actually. Yeah, not so many other distractions, Laura!! And it’s weird how everyone is choosing the Food/Wine trail as their preferred route!! A trek through the Flinders Ranges looks very worthwhile. The photos are so colourful, I would take thousands of photos throughout the 7 days! The half day train ride looks beautiful! We were just talking about a visit to Australia this morning. Our love for Nature, National Parks, Ruins and History and Steam Trains now put Flinders Ranges at the top of our bucket list. We road a steam train in Scotland and it was incredible – the Pichi Richi looks like a great ride as well. Thank you for the information. I will pin for later as well. So glad my post has inspired you, Eric! But I think you’ll find this Railway trip a little bit different to Scotland, haha!! But if you want to visit Australia, you won’t get much more Aussie than the Flinders Ranges! This looks like a beautiful place. I would love to get some hiking done here. Beautiful photos, postcard worthy. This is like my dream trip!! I have always wanted to do a South Australian road trip. I’d love to take the food and wine route. I’ll be bookmarking this post for later in the year when I am back in Aus. South Aus is truly a hidden gem! This looks like the kind of place we’d love to self-drive, as the views do indeed look amazing. I would love to learn more about the culture and heritage. Self-drive is the best option in my opinion, Indranil! That way you can go wherever you like and take it at your own pace! Your beautiful photos say it all! South Australia is a gorgeous place, and it must be awesome to have so much of it to yourself. I love how you organized your post with the must-sees in each area. Very easy to understand and a great resource! Hope you get to use it one day, Tami – thanx for your kind words!! We visited Australia last year and your stunning photos brought back so many memories. We only managed a part of the country, but I would love to get to the Flinders Ranges in the next few years. Haha, a year is good, Lydia! Don’t let anyone talk you into a shorter trip!! I had no idea there was so much to do at the Flinders Ranges. How difficult would most of the hikes be? Though I haven’t yet put Southern Australia in my travel list, but this itinerary surely looks amazing. Especially the way you have explained, it surely makes easy for the one who is planning to visit. A lot of people start their Aussie travels by visiting the eastern states and Uluru, Anushka – I’d probably do that too if it was my first time here. But South Australia is one of the best hidden secrets to discover! That looks like a beautiful range. I would love to check out the area around Ikara-Flinders Ranges National Park as well. Since I’m a hiking freak, I am particularly interested in hiking all the way up to St. Mary’s peak. Cheers!! I will be visiting South Australia at the end of this month for the very first time and I am so excited! The mountain ranges you have captured in your shots looks absolutely incredible. All those shades of red and brown and green and yellow looks so beautiful. I hope I will get a chance to visit the Flinders Range at some point, but I would definitely need to take my time as it seems like so much to see. I have always had a fascination for the interiors of Australia. Except for some frontier areas, one can’t imagine such open expanses here in India. This is exactly why I find this fascinating. Thanks for taking the trouble to list out all these possibilities. I think the first thing I will go for is the stream train ride. Yes, we are lucky to have so much space down here, Jitaditya – but you wouldn’t want to visit all year round! The train is a great choice – it’s a lovely trip through spectacular scenery! Ahhh! Yet another gorgeous place I’d like to visit in Australia. When I finally make it there, I’m seriously going to need a three month trip to see and do everything I’d like to. I’d be all about the food and wine trail, then doing some hiking to work it off. As a wine lover, tasting Australian wines is high on my musts for when I finally visit there. You may just find that even 3 months isn’t long enough, Jennifer 😀 And that’s just for the wine tasting, haha! Sounds like you’re REALLY going to enjoy a trip downunder! What I love about Australia is that you can be in the middle of the most incredible landscapes, but have them all to yourself! 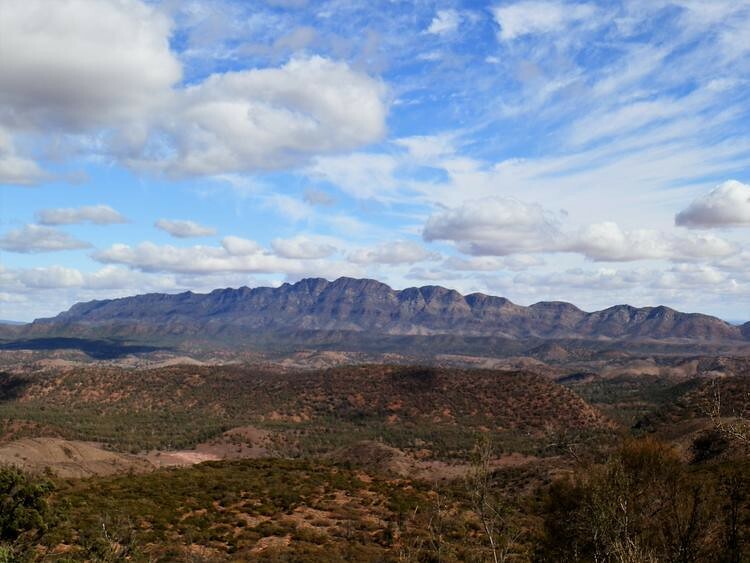 The Flinders Ranges scenery truly is stunning – I think it would take me a lot longer to explore, as I would be too tempted to just sit and immerse myself in the view! Thanks for the great info for putting the flinders range into a 7 day trip – I would love to take the Food and Wine trail via Clare, and make a point of taking in St Mary’s Peak, even though it sounds like a pretty challenging hike! So much incredible nature – thanks for putting everything into a guide! Australia’s good like that, Meg!! And every time I write a 7 day guide, I KNOW I have already spent way more than 7 days there – we’re such slow travellers (as well as hikers) 😀 But if you DO only have 7 days, you could still see shedloads – then tack on some of the other experiences if you want to extend your stay! A well-detailed guide and so informative. I didn’t know that there’s a trail like this in Adelaide, my very first to hear about Flinders ranges and it is a guide for beginners like me. I kind of like knowing that there are great resources when finding things in a place like this thinking that it’s way to the south in a secluded place. I find this an off the beaten path journey. I wonder how humid will be in the best months. It’s more HOT than humid, Ferna – in summer (Dec-Feb) the temperatures get up into the 30s and 40s. In the cooler months, it can also be quite dry – the rainfall comes from storms rather than steady falls. It’s an amazing place – right off the main tourist track! 430km of mountain line. This looks a lot like parts of the Appalachian trail. Stone rocky desert with a small bit of shrubs everywhere. There’s so much Australia can offer. We do BIG very well down here, Johann – especially in the Outback where rocky desert and shrubs go on for many miles! I love how detailed this guide is! The blinman underground experience sounds super neat. The entire route looks beautiful! Thanks Nina! It’s an awesome place to visit if you love the outdoors! I am so surprised you can do that much in Flinders Ranges, up to 7 day adventure. After reading all through your detail guide, I say yes that ‘s true. You must be very proud of your Flinders Ranges to know everything to small details there. Hope one day to be your travel companion in Flinders Ranges. Haha, you have to like natural attractions and outdoor activities to happily spend a week there, Long – but if you DO like those things, then you can easily spend a MUCH longer time! I’ve only ever been to Adelaide in SA and wish I had time to explore a little more of the state! The ranges look amazing – I can’t believe how many different trails there are. Your itinerary is great – way to keep someone busy for 7 days! Time is always a problem, Flo – especially in Australia where distances are great and it takes awhile to get from one destination to another. But that’s what ‘next time’ is for, right?! Some amazing colours and scenery here. Australia really does have everything when it comes to scenery from amazing coastlines to unforgettable red centre. It sure does, Mark – especially if you like natural attractions and a LOT of wide open space! Wow the South Australian Outback is truly a haven for the nature lover. The landscape is so unique and it is beautiful that way. I would love to explore this part of Australia someday, it seems like it would make for a great photo subject too! We do natural attractions REALLY well down here, Abigail!! And the photo opportunities are endless – just ask my Flickr viewers!! Oh gosh I can’t believe how beautiful it is! I didn’t even know Southern Australia has amazing landscape like this. Next time when I go to Australia, I will go here! The Flinders Range looks like an outdoor adventure paradise. So ment great hikes to explore! Then my post has succeeded, Brianna – it IS an outdoor adventure paradise! Not only is this an incredibly practical and useful guide (to a place I’d never heard of but now want to go to, no less), but your writing voice is great! I love “Coastal Ports (tautology alert! )” — HAH! View from the loo!!! LOL. Haha, nothing quite like a scenic loo to make your landscape ROCK, Leanne! Haha, scenic loos are my speciality, Divyakshi! They’re just another attraction to look out for 😀 It’s a real natural attraction wonderland – glad you liked the look of it! I feel really terrible that I had not heard of this area before, but it looks so amazing and your guide is perfect – detailed and with so many tips of what to do. Would love to just see it for myself and particularly the Kanyaka Ruins and all generally just the views! Beautiful. Lots of people haven’t ever heard of it before, Sarah – but that’s a good thing because you can visit without the crowds!! Hope you get to see it for yourself one day! Glad you enjoyed it, Mike! The Heysen Trail is an awesome adventure – and so are the Flinders Ranges! Hope you get to see them both one day! Thank you for such a comprehensive guide! It looks amazing. Wilpena Pound has always been on the list but Quorn sounds nice too. I’d definitely like doing the Dutchman’s Stern hike. I love hikes offering beautiful rewarding views. Your photos are great I love the colours. Thanks so much for sharing. Hiking is the best way to *consume these kind of terrains! Amazing landscape… Australia awes me with its beautiful rocky mountains. Australia being Asutralia, it’s really good to know things in advance when traveling in the wild! Haha, you’re right – planning ahead is essential when you’re travelling downunder! But now you can use my guide to plan the Flinders Ranges, at least!! We haven’t been to Australia for over 25 years and when we were there we basically only spent a few days in South Australia. We would love to go back and explore the region in much more depth, especially the wine region. Thanks for the detailed guide, perfect. The Flinders range is a part of Australia I’ve never heard about. I can see why you would need 7 days to discover it properly. The Pichi Wichi Railway tour sounds like a must. A lot of people try to see it in a day en route to somewhere else, Linda – but there’s so much to see, especially if you like natural attractions and are not afraid of the Outback! Such fantastic photos! It reminds me somehow a bit of Mad Max 😀 Count me in for the Food and Wine Tour, this sounds exactly like our thing! What Food do you get exactly in this Region? You’re so lucky to live in such a lovely area! I’ve wanted to visit Australia for such a long time but I must confess I didn’t know this area. I found your itinerary comprehensive and easy to follow so I’m saving it for later use, thank you! Yes, I AM lucky, Dany!! I’m always amazed that the Flinders Ranges aren’t more popular – but everyone’s too busy going to the Rock, the Barrier Reef and Sydney! But that generally means less crowds! The more I read about Australia, the more convinced I am that the country makes for one of the best road trip destinations. Such fantastic natural landscapes. Hope to follow your league soon. Unless you fly, which can be expensive, the best way to see a LOT of Australia is by road-tripping, Punita – because everything is so far apart! Wow, awesome photos! Such a comprehensive and helpful guide too! Blinman Underground Experience sounds like fun. Can’t say I have ever used a scenic loo before haha so that’s something new! Oh! Now I know what I missed when I was in Australia. Living in Sydney, we visited Queensland and Victoria but not to South Australia. This looks like a dream to me. Love those dry mountains… almost like a barren place. But so full of life. My favourite is view from Hucks Lookout. Oh yes, 4WD is very important. Haha, South Australia is like a completely different country, Nisha! It’s the driest state, but that just gives it a wild beauty – IMHO! Whoa those views are certainly killer! Thank you for such a great itinerary. You’ve got it all laid out beautifully 🙂 I’ll be taking that Heysen Trail! Hope you get to use the Flinders Ranges itinerary one day, Alice! I’ve been on bits of the Heysen Trail, but never the whole thing. I keep saying ‘one day’, maybe I’ll see you there sometime!! Amazing photos! I can’t get over the fact that you get to see things like that all the time 🙂 As rural as it looks, though, it also appears there’s a ton to do. Maybe someday we’ll finally make it down under 😉 thank you for sharing!! Haha, you don’t need an urban area to find things to do, Meagan – although it helps if you like the outdoors and natural attractions 😀 Hope you get down here one day!! Don’t miss it, Kathy – and add Arkaroola to your list too!! As long as it’s not midsummer, haha! Fabulous photos RED. Brought back memories of our trip through there. Even Grumpy loved the train trip. Beautiful photographs of these dry looking mountains. I very much enjoy your written descriptions. Most interesting post. Hey, TFG! The South Australian Outback is one of the most arid regions in Australia, if not the world! But that’s what makes it so special 😀 Glad you enjoyed it, will you visit one day do you think?